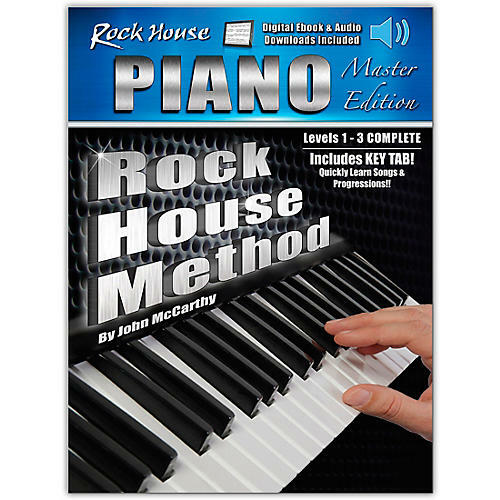 Designed by John McCarthy for piano or electronic keyboard, this Master Edition combines all three levels of this award wining series in a complete course! As a bonus we have included a complete Key Tab section that will quickly and easily show you how to play chords, progressions and entire songs. Learn all the essential techniques needed to play all genres of music. Start with proper posture and hand position. Next you will follow a gradual and progressive learning path to read music and play songs and master the keyboard. You will learn everything from classical pieces to blues progressions and challenging techniques. Learn melodies, scales and the basics of improvising. As an added bonus, included are audio backing tracks and playing examples you can download that follow each lesson and let you apply them over full band backing tracks.